Everyone has their favorite guilty pleasure food. I, personally, have several. A lot of them are homemade, like homemade slushes or taco pizza. But I have quite a few favorites found at restaurants around town too. Most of these cravings came during my pregnancies. But a few things that I really craved when I was pregnant that totally disgust me now: Think whole grapefruit and chocolate milk—yuck! 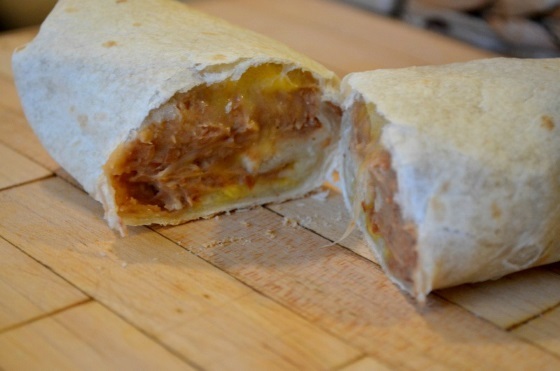 One thing that I did crave when I was pregnant, and still do now, were bean and cheese burritos. Specifically, the bean and cheese burritos from local 24/7 drive-thrus. They have so much more flavor than the ones you can get at fast food joints. Instead of wasting $3.00 every time I wanted one, and since I really didn't know what was in them, I decided to try to make my own at home. So I started experimenting with ingredients I had at home. I found that light pinto beans have the best taste and, with a mild mix of spices, I was able to duplicate the taste of one of my favorites. Bonus: For less than $2 I can make 4–6 of these, enough for family dinner and a few leftovers for lunch. 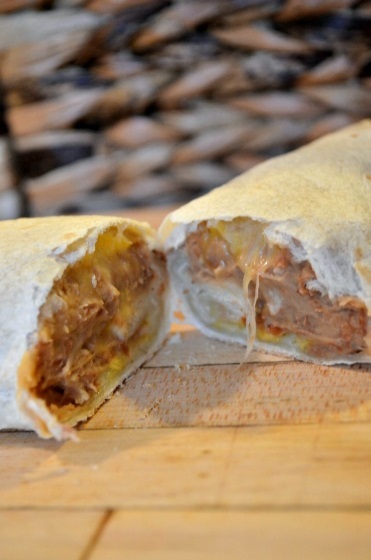 Once you try these you'll never go back to take-out burritos again! In a large saucepan combine first 7 ingredients and bring to a boil over medium-high heat. Preheat oven to 400°F. Place bean mixture into a Blendtec WildSide+ jar and press "Batters. "* If there is not enough liquid to create a paste you can add 1 tbsp of milk at a time and blend for 10-second intervals until a smooth paste is created. Spread 2 tbsp of cheese along the center of a tortilla and top with 2–3 tbsp of refried beans. Roll tortillas and place in a 9x13 baking dish. Repeat with remaining tortillas. To reheat, place on a microwave-safe plate and cook in microwave for 30 seconds. These burritos may look small but they are super filling. One of them leaves me more than full, and my husband, who has a big appetite, can eat one-and-a-half, or two, max. If you like more kick you can double the spices. Or add your favorite hot sauce on top of the refried beans before you roll the burrito up. *If your blender does not have a Batters cycle, blend on Medium Low (speed 3 or 4) for 15-25 seconds or until a thick paste is created. About the Author Sydney is a stay-at-home mom who has a passion for saving her family money without sacrificing flavor or style. She enjoys creating treats, toys and memories with her family. Join Sydney at Tastefully Frugal for recipes, crafts, tips and tricks on how to do more with the money that you have. To see what she is up to every day follow her on Facebook, Instagram and Pinterest.